Rapid environmental and socio-economic changes caused by climate change, population growth, migration, and other factors create important challenges to agricultural production in Central Asia. More intense droughts and soil salinization are among the key environmental problems that smallholder farmers in Uzbekistan face. The necessity to ensure that farmers have access to varieties that can cope with these problems becomes particularly relevant. After gaining independence in 1991, the Republic of Uzbekistan started a process of reforming agriculture, including adoption of laws on plant breeders’ rights (1996) and on seed production (1996). At the same time, dismantling of the state seed farms adversely affected the seed supply for a wide range of traditional agricultural crops, including vegetables and fruit trees that are crucial for the livelihood of farmers and the nutrition of the rural population in Uzbekistan. Lack of public support resulted in deterioration of field genebanks and mother orchards and weakening of the quality control system for seeds and planting materials. Moreover, in the absence of efficient mechanisms for monitoring demand for seeds, neither plant research programs nor seed suppliers were certain about farmers’ needs and preferences. Consequently, many fruit and vegetable varieties with valuable nutritional characteristics and promising adaptation capacities have been lost in farmers’ fields. The situation was aggravated by the fact that most of the local varieties historically selected by farmers based on their good performance in certain agro-ecological conditions are not included in the State Register of Agricultural Crops, thus limiting the seed producers’ capacity to subject seeds of these varieties to formal quality control required for commercialization. To address these challenges, the Uzbek Research Institute of Horticulture, Viticulture, and Wine-making, the Tashkent Agrarian University, and the Uzbek Research Institute of Plant Industry joined forces with Bioversity International under the project "Improving seed systems for smallholder farmers’ food security” funded by the Swiss Development and Cooperation Agency. PIM provided additional funding support for the project as part of its research on governance of natural resources. The project team studied existing systems of seed and planting material production and commercialization in Uzbekistan to identify agronomic, socio-economic, and policy factors that limit farmers’ access to quality seed and planting material of selected target crops originating in Central Asia: apple, apricot, pomegranate, grape carrot, and onion. The research results show that individual farmers are the key suppliers of seeds of these species in several provinces, and represent an important share of the total seed supply in those provinces where they are not the main suppliers. Farmers supply 61% of tree planting material in the Northern part, 68% in the Central part and 34% in Fergana Valley. In the case of vegetable crops individual farmers represent 45% of seed supply in the Southern part, and 100% in Northern part. Farmers’ seed systems allow seeds to reach farmers in remote areas and usually ensure the supply of crops and varieties well adapted to local agro ecological conditions. However, seed quality is not ensured in these systems and farmers’ exposure to improved varieties is limited. The project paid special attention to the channels through which farmers obtain information, as well as foundation seed and grafting material of new and traditional varieties. The study showed weak connections between research institutes and farmers, as well as between farmers and seed quality control organizations. The research results informed a series of actions focused on increasing connections among research organization, quality control agencies, and farmers; introducing farmers to a wider range of varieties of the target food crops; and raising profile of fruit tree and vegetable species in public agricultural strategies. Thanks to the project’s interventions, significant increase in the number of propagated varieties has been observed in tree nurseries for apple and apricot (30% increase on average in all the project sites) as well as in the quantity of high quality samplings of target fruit tree species (around 11% in the two project sites located in the center of Uzbekistan and up to 45% in the site located in Fergana Valley, in Eastern Uzbekistan). Interestingly, farmers have been the main force behind these increases. This was not the most expected result in a country where farmers have traditionally been seen only as consumers, not generators of agricultural technologies, and whose involvement in formal seed production has been very limited. 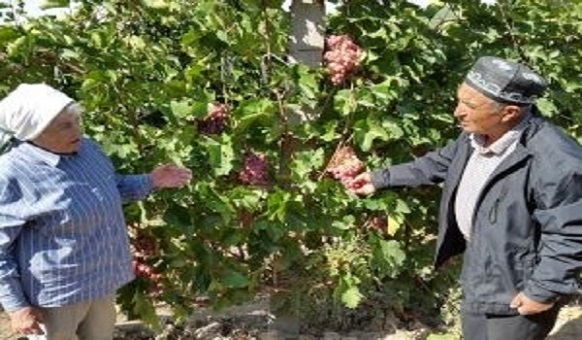 In their role of producers and traders of good quality seeds and planting material, Uzbek farmers received support from the Uzbek Research Institute of Horticulture, Viticulture, and Winemaking. Researchers worked closely with farmers to develop quality standards for fruit tree samplings and create portfolios of varieties adapted to specific environmental conditions and market demands of each project site. For example, for apple production in Khorezm and Karakalpakstan provinces, the project offered to farmers portfolios of varieties that tolerate saline soils, perform well under drought conditions and extreme temperature fluctuations, and mature at different periods - a combination allowing farmers to maintain apple production during the whole season and thus making them more competitive in increasingly demanding fruit market. 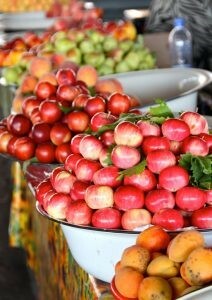 The project has contributed to integration of fruit tree and vegetable species in Uzbekistan’s agricultural policies. Specifically, the Decree of the President of the Republic of Uzbekistan (#PP-2460) "On measures for further reforming and development of agriculture for the period of 2016-2020” (2015) orders that the area under cotton and cereal production be reduced by 170,500 and 50,000 hectares respectively to provide more space for fruits, vegetables, potatoes, and other food crops. The transformation of agricultural land for crop substitution started in 2016. Special farms for producing quality seed and planting material of vegetable and fruit crops are to be established and mobile laboratories for pest and diseases control created. The Decree of the Cabinet of Ministers of the Republic of Uzbekistan (#311) "On measures for training highly qualified experts for agricultural sector” (2015) prescribes creation of a national capacity building program focused on young specialists in the area of seed and planting material production. Preliminary results of this Decree are the establishment of a research institute on breeding and seed production in Termez (Surxandaryo Province), revision of the curriculum at agrarian universities in order to include more academic hours dedicated to seed production matters, and new training programs being developed by universities for implementation by extension services in relation to quality seed production by farmers. These measures represent an important change in Uzbekistan’s agricultural policies, allowing reduction in the traditional emphasis on cotton and wheat and significantly increasing focus on vegetables and fruits as part of a more diversified and sustainable agriculture.